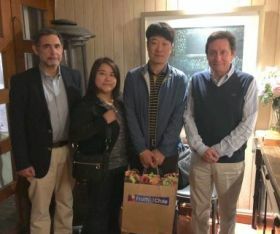 South Korean plant health inspectors visited orchards and packhouses in various regions in Chile recently to monitor export protocols ahead of the start of the new campaign. This will be the second season in which Chile sends significant cherry volumes to South Korea following the opening of the market for shipments under a Systems Approach. Exports for the 2017/18 season totalled 2,641 tonnes, a 95 per cent increase on the previous campaign. “Although China is the main destination for our fresh cherries, we are looking for greater market diversification and South Korea is an attractive option, currently being the third destination for Chilean cherries in Asia,” said Asoex’s Miguel Canala-Echeverría. Initial estimates from the Chilean Cherry Committee point to an export volume of 180,020 tonnes this season, but this may be revised downwards in light of recent adverse climatic conditions.